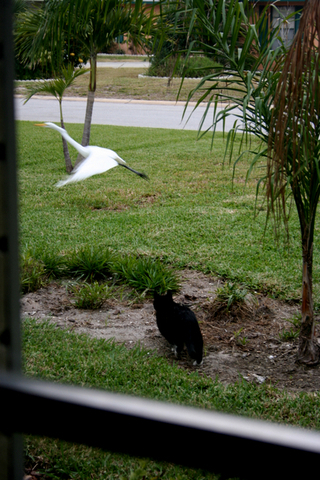 Here's Zoey going after the egret, first time I've ever seen one of my cats go after these birds. 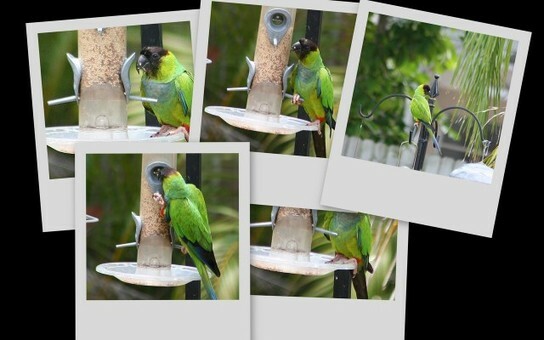 I shot these photos through the living room window. I really need to clean the glass!. No matter how often we chase the bird away, he'll return. 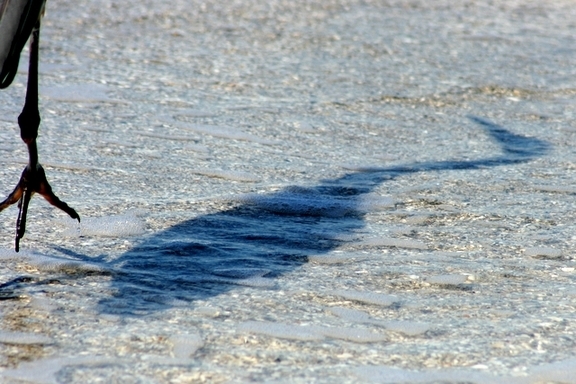 These birds are persistent, folks Once they discover a source of food, there's no stopping them. He's after the fish in our pond. I had to give in and run tacky fishing wire every which way across the pond. I really need to give the pond a good cleaning,too. Should have used a faster shutter speed! 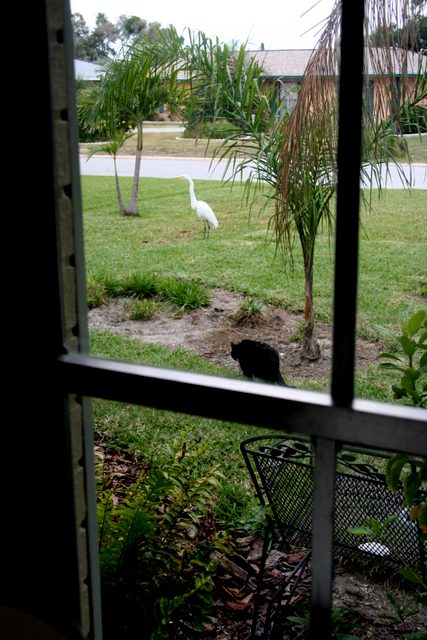 The egret was not at all fazed by our overweight, out of shape, feline security force and returned a few seconds later. This photo was taken through the glass on our front door. As soon as my hand hit the door handle, he flew away. Meanwhile, Zoey, who has Hunter's Deficit ADD, forgot all about the bird sitting 15 feet away. Our fish had to fend for themselves. There was a dirt to roll in!!! Zoey was not allowed back in the house afterward. His fur had a solid gray cast to it and was covered with bits of chopped leaves..
As for the bird...he sits and waits....bidding his time. Boy, I've got to tell you what happened over Thanksgiving. I'm back home again and at last the story can be told. We've been trying to get rid of Petrie for awhile now, but nobody wanted to take him. Too many scars on the kids hands, arms and ear lobes tend to warn off prospective bird parents, who would cringe when we'd stick our hands inside the cage to take him out and show him off. Most ran screaming from the house with Petrie close in flight. I didn't think we would ever get rid of him. So for Thanksgiving, I snuck him into the back of the SUV with a big towel around his cage and we headed to my parent's house and their big, back porch. My sister in-law is good with birds and I was hoping she would take him. So my evil hopeful plan was to simply bring him along unannounced, and keep his cage out in the back porch, where she'd be sure to see him as soon as she came in the door, and spend time with him, crooning away as she always does, and fall in love with his relentless squawking melodic chorus. Well... the bird had other ideas. 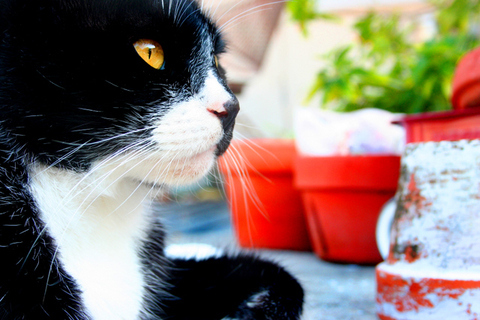 The next morning, the kids all ran out to the back porch to see him, with their mother in tow. Samantha took him out of his cage, something he normally loves, but this time, he squawked and complained and flew to Brittany's head. When my sis-in-law tried to take him, he snapped at her. Then he managed to fly around the porch, through the kitchen door and into the kitchen where he took rest on my niece's shoulder. When she reached up to stroke him he bit her on the finger instead. Everyone decided to act as calm as possible to placate the little beast. We crept off quietly, leaving the bird business up to Sam and my sis-in-law so that he wouldn't feel as if he was being chased, thereby becoming more frantic in the process. But instead, he flew after Brittany, and when he landed on her shoulder, he bit her on the earlobe, drawing blood. Then he attacked Sam, who had reached up to grab him when her sister yelped. Again, he bit down hard, causing Sam to yell in shock. I'd had enough. I grabbed his scrawny bird body and threw him in the freezer and slammed the door shut. Instantly everyone began yelling, so horrified were they over my ending his mean tempered, ornery life in such a frigid manner. Sam marched over and opened up the freezer door, pulled out a very stunned, frozen little cockatiel. "I'm sorry I bit you," he said. ....and all of us stood there in shock. Then he nodded to the freezer and looked back at Sam again and said: "May I ask what the turkey did?" 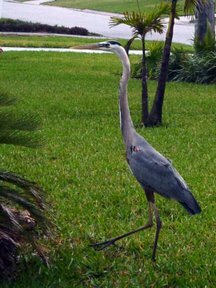 Meet the only bird my cats are afraid of, our local Great Blue Heron. One look at that beak and you can see why. 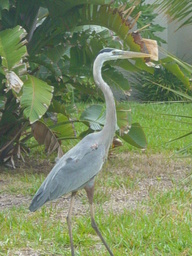 Every once in a while, he'll wander into our yard and feed on the goldfish in our pond. The cats always take off. On the plus side, PetSmart was selling cheap feeder goldfish, about two inches long, 12 for $1 last year. I don't dare spend money on expensive Koi, having lost my last batch of beautiful Koi to these bastards magnificent birds. 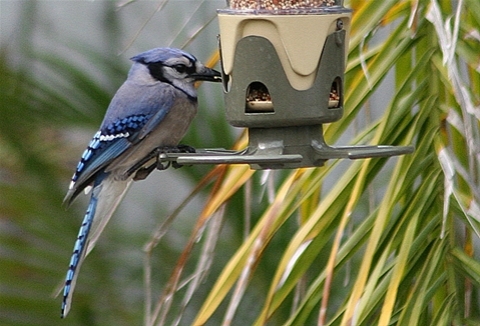 Those little feeders are now a good six or seven inches long and extremely fat. 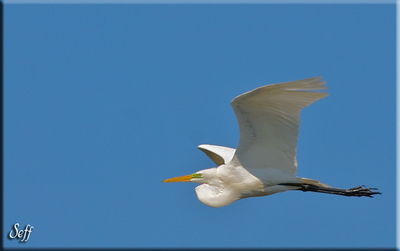 We have a white egret that has been hanging around lately. Any day now, he's going to get fat too. from the safety of our living room, Percy keeps watch. Unfortunately, he hates to go outside and would rather run under the bed then confront the sonuvabtch magnificent beast. I might as well stock up on more fish. If anyone has any OTHER ideas on how to keep the birds out of our pond, send 'em! Fishing line, strung across the pond and woven into a web to keep them out.... doesn't help. They'll gingerly step in and around it. Anyone up for sentry duty? The Creepy Foot moved in to attack the innocent shadow. What do you get when you combine an urgent need for an anti-histamine with a scalp splitting, sinus induced migraine--as well as a shock from an totally unexpected whoooosh! against your throbbing skull when you go outside to get the mail? And the mockingbird is alive only because she didn't nick my scalp when she dove in for the attack. She may not live very long. 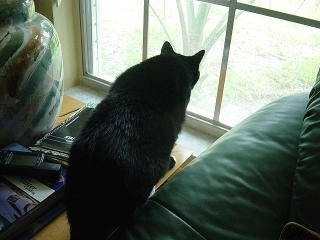 Two of my cats have been called up for sentry duty. If they weren't so fat, they could actually jump a little higher to catch her... the fact of which Ms. Momma Mockingbird is keenly aware of. She really does taunt them so. I plan to resume my normal posting and commenting schedule very soon! 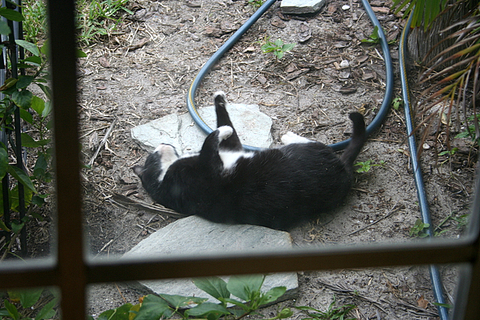 I shot this picture through the windowpane in the living room, and had to take it quickly because he was gone in an instant. 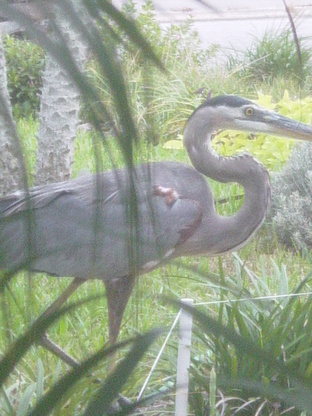 He was going after the fish in my pond again. This one wasn't as brave as the other birds that I've shown in this category of photos. 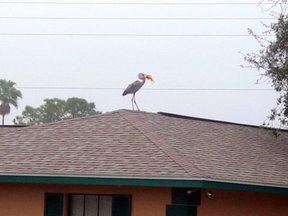 The herons like to challenge me by hanging around on a neighboring roof to see if I'm going to go back inside the house again. But this little guy took flight for better waters. I'll cut him some slack. After all, I still have fish in the pond. Y'all are welcome to let him field your questions. 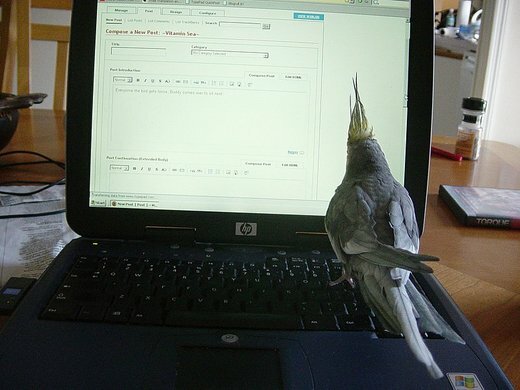 Just be patient while waiting for answers; he's a hunt and peck typist. (groan... wasn't that the worst pun on earth??). Fill in your own caption! Last night, I would have given my entire kingdom for a carbohydrate. Wouldn't that have been some Kingdom? It would have come with a house, a pool, a pond and it's very own bodyguard. There he is, standing sentry, right over the front door. I took this picture a month ago, but he has returned on a weekly basis. He is ever vigilant. I once thought the reason we don't have break-ins is because we have an ornery dog, but I think it's the beast on the roof with the orange spear that keeps 'em at bay. Lately they have been awfully good. Something is up. Either that, or letting them sleep in all morning really does affect their moods. OR, the bird is getting to them... and they are VERY AFRAID. Now y'all know about my ongoing war with the birds that come in off the gulf and eat the fish out of my pond. I used to buy expensive Koi, but now I'm reduced to buying cheap feeder goldfish: 12 for a Dollar. Believe it or not, lil feeder goldfish can grow very, very big in a pond. So it kills me to lose them to the murderous Egrets and Herons that frequent these shores. Don't they find enough fish in the sea? They are LOSER HUNTERS that's what they are. Outcasts of the Bird Kingdom. Incapable of fishing from the bounty of the sea, they prey on smaller ponds where the pickings are easy. They're a disgrace to the hardy birds that hunt and fish legally and ethically in the sea. Now I've also written about the ducks that come in out of a neighboring pond and swim in my pool. 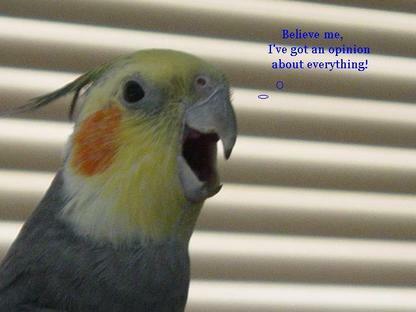 Birds in general give me a hard time. 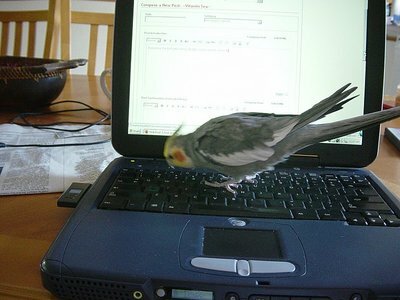 I've written about Psychobird and he still hates me. Scroll down under the Bad Birds of Our Time link and you can read all about his wiry little self. They are everywhere, these birds and we can't get away from 'em. 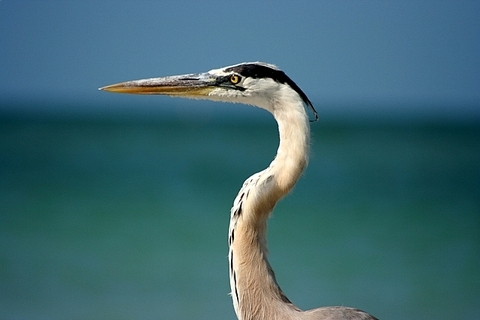 This is your Memorial Day Bird Warning Post. Last night Rick and I were sans children, so we headed over to the beach with burgers and fries and a big blanket. After we spread the blanket and got settled, Rick nudged me and pointed. 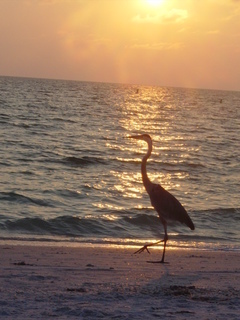 And there he was, this giant Heron, on the shoreline staring into the sunset. Thought he looked kinda sad. eck, I felt sorry for the ol' guy. How isolated and hungry he must be. Then he turned abruptly, and glared at me. Started toward our blanket. I swear, I thought I was gonna get speared. Instead he headed toward a group of buckets owned by a fisherman and his wife. hung around, hoping for handouts. I feel sort of guilty, you know? Regardless of what the calendar says, it is summer in Florida. The heat is making me delirious. How many of you buy kleenex based on the way the box looks instead of the price? a. Do you buy the National Enquirer? b. Do you read it voraciously? Also, the ducks are back. My three Good For Nothing cats haven't been able to keep them away. This picture was taken 2 months ago, shot through a pane of glass on the french doors. I think the local pond is getting overcrowded and that's why they're coming in. I'm *this* close to buying a cheesy fake owl to put outside. All the docks around here have owls on the dock post to keep the birds off, so maybe it would keep them out of my pool and my pond also. 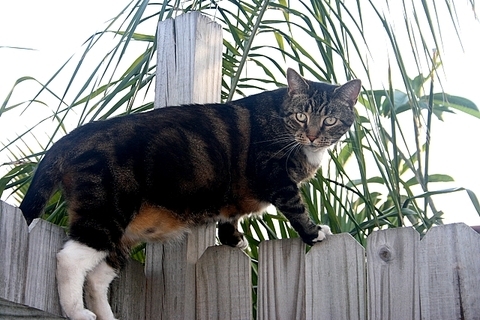 The fat cat on the left is the Great Rico Suave, adopted from the shelter a few years ago. But so far, he hasn't earned his keep. I think his blubber is what keeps him from being a mighty warrior. Notice the one duck looking at him. 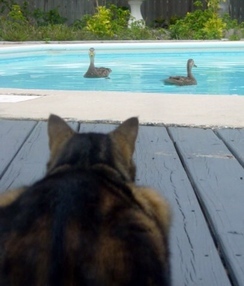 Duck knows the cat isn't going to charge, go airborne and do a belly flop into a pool of water. So they just kept swimming... round and round they go. Seff, our resident photographer extraordinaire, sent me this photo this morning. 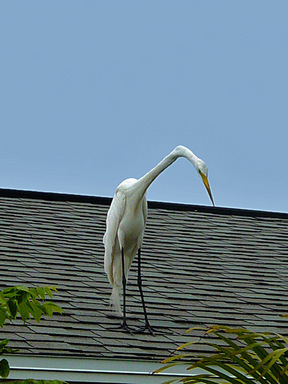 I already knew the Egret Army was about to invade because I took a picture of one on Tuesday, and it was sitting on my roof, looking down at the pond. 'course, MY picture, (i'll publish it later,) is not as good as this one is.. my gawd. just how Seff was able to capture that bird in flight is beyond me. 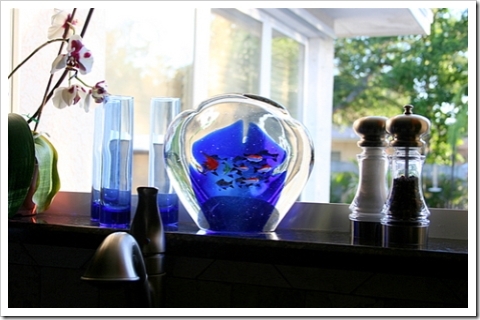 See more of his work by clicking on the link in the sidebar. <---------------- Well look who strolled in today just as casually as you please. DO I NOT HAVE ENOUGH PROBLEMS WITH BIRDS AROUND HERE?? She has certainly made herself at home this afternoon. I went outside to clean the pool and after a few minutes I heard a splash. Turned around to see this duck swimming around in circles. She's been camping outside on the deck ever since. We also have one Very Angry Kitty, Rico wants this duck with a passion. He was outside on the deck with me when I was getting the net ready to clean the pool and his eyes got very wide when he saw the duck. I had to chase him clear across the yard to try to catch him. Samantha finally caught him later on and stuck him in the house, where he protested for another hour before going to sleep. Samantha wants to keep it, which will NEVER happen. I've already had to hose off the duck duck doo and I have no intention allowing it to continue. I'll be letting Buddy out shortly, after Brittany gets a chance to see him when she gets home from school. There are two large ponds outside of a subdivision near me, I think she came in from there. Time to go back home Lucy. By the time dinner was over with and an hour had gone by, I couldn't take it any more. I had three complaining housebound cats inside that wanted OUT in no uncertain terms. Meanwhile the duck WOULD NOT LEAVE and everytime I sent Buddy outside after it, she'd simply slip into the pool and then Buddy would run around the pool in circles barking up a storm. This didn't faze the duck NONE. (pardon my grammar). And everytime I chased her off she'd simply jump in the pool. I turned the hose on her when she was in the back yard, but of course she loved that and simply stood there enjoying the "waterfall". Rick and I finally got a net intending to scoop it up and take it to a nearby pond. As soon as we went outside with a throughly excited Buddy, the dumb duck finally took stock of the situation and flew away, high over our heads and over the house. It rained most of the week, and our feelings were waterlogged and wrinkled. Now, Rick lives in a house with 3 women, and some of us had cabin fever. (Insert sympathetic guy feelings for Rick if you feel you MUST). It is 7:25 a.m. I'm going out to the garden to see what's going on. I'll be back to report shortly. 5pm Update: Got 3 new yellow bell peppers out in the garden. I hope we get to eat them before the worms do. and later: Before she left to go out with her friends, Samantha came back in the house to tell me that... "Ali says your bird is out by the pond again." First of all.. IT IS NOT MY BIRD. The Enemy has returned. 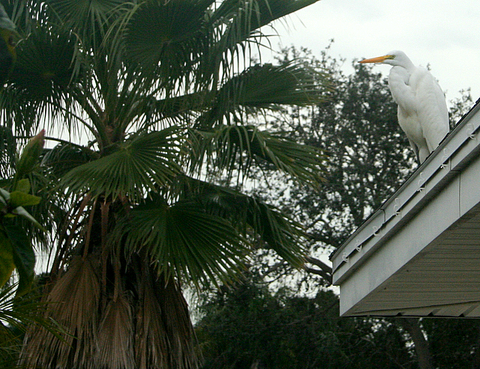 He flew to the top of the neighbor's house when we pulled into the driveway this afternoon. It chills me to realize he's been stalking my pond when we're not at home. He's taunting me, I know. Wants the last 2 surviving fish in the pond. I don't think I'm going to win this war... this ferocious battle of woman and bird. I tried to send Buddy out there to patrol the premises, but it started raining and he refused to put a paw outside the door. He looked very sad. Perhaps the bird is working on him. Samantha asked me to take her shopping tonight for bathing suits because spring break is here. I need a new one too, but I told her I'd rather have a root canal then try on bathing suits in the fitting room. do you like my sunflower? you better. 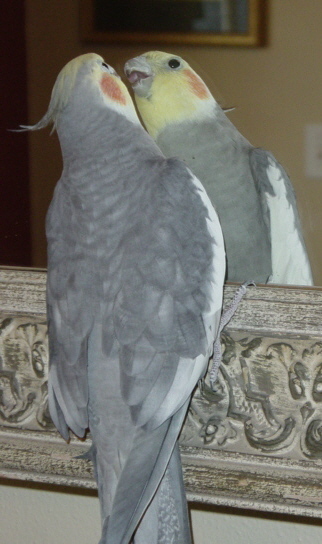 Some of you know all about Samantha's psycho-bird, a 2 year old cockatiel that hates everyone in the family except for Brittany. Whenever he's released from his cage, he'll fly around the house in search of her. Once he finds her, he'll perch on her shoulder and sing and chortle for all he's worth. 'course, this is hard on Sam. It's her bird, after all, and she's the one that cleans its cage, feeds and waters and make sure he has plenty of toys and exercise. And yet he still flies to Brittany without fail. Over the past two years, I too, have tried to make peace with this creature. Since he squawks relentlessly, I thought it would be good to teach him to talk instead. Every morning I head to his cage and lift the sheet that covers it up and sing " ~Gooood Morning Psychobird!~". I call him that because it fits, even though it isn't his real name. He is just as mean as all get out. He bites, screeches and attacks whenever you come near his cage. But I figured if he could learn to talk, then he'd feel a little more secure in our human world and he'd be proud to tell us what he thought of it all. So in addition to the good morning ritual, I talk to him often, but I never get more from him then a nasty sounding "BAWKKK!" Well, my mom wrote to my cousin, who raises birds out in California and asked for his advice on what to do. He wrote back a long letter of suggestions and went on to say that birds have a pecking order, and that they need to feel part of a "flock", as it were. Our family was a flock to him, and it was important that he realize his place in the pecking order too. He needed to understand that he was not the "head bird" here. And it was equally important that he realize that he was part of OUR flock, we weren't part of HIS flock. Am I making sense here. Last night we got together to act on a few of my cousin's suggestions. I was hoping we'd teach him how to talk in the process. We assembled in the family room and Rick, as the tallest of us all, reached into the cage for the creature. It took some doing. Bird went into attack mode immediately. 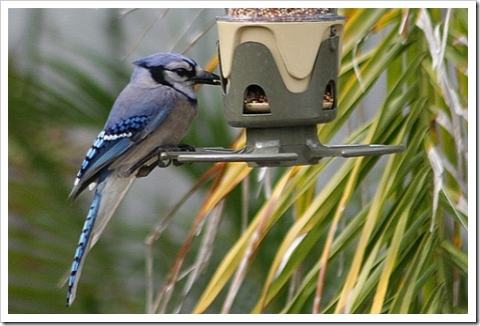 He bit and hollered and flapped his wings rapidly. I was scared to death. As soon as he was free of the cage, he flew off Rick's hand and began to fly in circles around us, looking of course, for Brittany, who was sort of cringing as she stood there with her arms covering her head. Sam took charge. The first object of the Flock Family Order was to clip his wings so he wouldn't feel the urge to fly away. Unfortunately what happened next ..... oh man. She was able to convince him to land on her arm for less then a moment, before he bit her finger and flew off. She reached up to stroke him. and at that moment, he turned nasty again. Bit her hard on the nose and flew away, landing on Brittany. Brittany had enough, her sister was bleeding and all of us were looking a little frazzled. 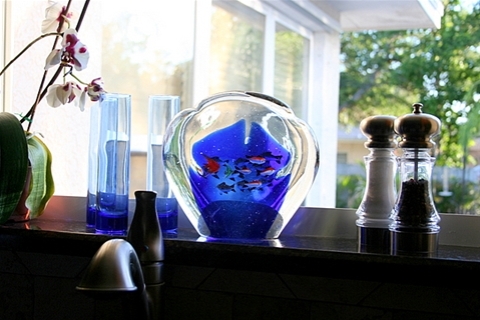 She headed into the kitchen to give the bird back to Sam... "try it again", she said. the bird would have none of that. Brittany had turned traitor on him, and so he turned on HER, flapping his wings wildly and screeching up a storm. Oh My Word. And before I could reach her, he bit her hard. And drew blood. Brittany let out a yell and at that moment, I'd had enough, grabbed the freaking bird, yanked open the freezer door and THREW his lil bird body in there. Sam started screaming "NO, MOMMY!!!!!" and even Britt was yelling "WAIT, WAIT", and there they are, both full of scratches and bleeding too. I waited a moment, looking at them, trying to get my heart to stop pounding so hard. "Alright," I said to Sam. "Go ahead and let him out. that'll teach the dumb bird a lesson." and I stepped aside. So she opens the door and pulls out a very stunned, frozen little cockatiel. Slips him onto her arm again. "I'm sorry I bit you" he says..
and all of our mouths dropped open.